Steve McQueen was a very versatile person. Not only was he a movie legend. Above all, he was a passionate car enthusiast. And in all Steve McQueen ever did, he showed a great air of rebellion. And probably that versatility made him so attractive to women. The combination of all made him the King of Cool and gave him an iconic ambiance. Movie legend, Hollywood rebel, woman swarm, style icon, and passionate motor sportsman – all that was Steve McQueen. The car enthusiast also lived fast privately. The Author Dwight Jon Zimmerman sheds a light on the life of Steve McQueen. All facets of his life are covered. The story of his film career, with legendary movies like ‘Bullit’, ‘The Great Escape’. Of course, we remember Steve McQueen mainly for this “Le Mans” movie, and his race career. The passion he had for speed, the way he drove iconic cars like the Porsche 917 and Porsche 908. 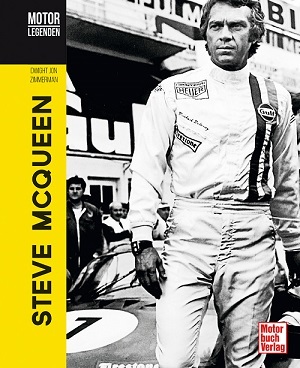 There’s absolutely nothing that remains uncovered in the “Motorlegenden – Steve McQueen” book. Unfortunately the quality of paper the book was printed on, was not the very best. But that may not keep you from buying the book and enjoying it.